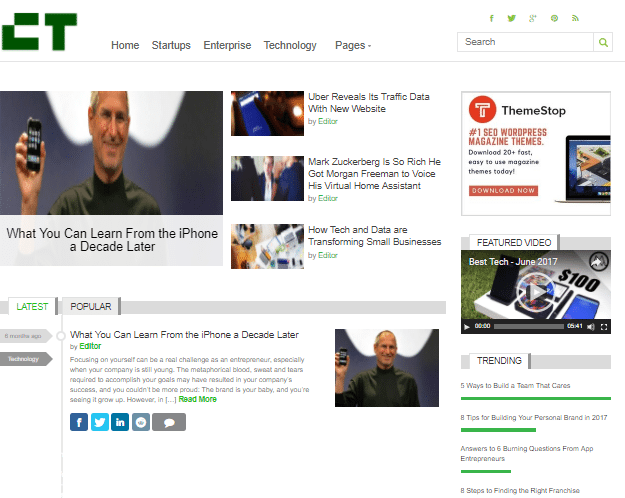 Crunchtech is specially designed to create tech magazine sites for publishing news, in-depth reviews, and other contents. The modern, trendy homepage design is bound to draw the attention of your visitors. As usual, you can highlight the best posts in the beginning. Below, visitors can choose whether they want to explore the latest or popular posts. The simple pagination will allow them to navigate through the available content pages. Built-in page templates will come in handy to create the basic pages for your blog. Crunchtech features a special dual sidebar design, which means you can choose to have the sidebar on the left, right side, or have the sidebar on both sides. There is a highlighted ad section that enables you to show advertisements along with your content. The theme comes with several custom widgets including one for displaying featured videos on the sidebar. The trending posts widget will show the posts with a popularity indicator so that the visitors can find the hottest content right away. As there are dedicated social sharing options on top and bottom of the post, they can instantly share the post on various social media platforms. Facebook commenting is another notable feature of Crunchtech that makes it a lot easier to leave comments on the posts.